UPDATED: Wed., Aug. 2, 2017, 7:56 a.m.
An extended heat wave will combine with winds to allow wildfire smoke to drift as far south as Spokane and across the region. The National Weather Service issued an air quality alert for Spokane, Lincoln, Pend Oreille, Stevens, Okanogan, Chelan, Douglas and Ferry counties through noon on Saturday. A weak weather system out of British Columbia is expected to create conditions for winds from the north, carrying wildfire smoke from Canada and Western Montana into Eastern Washington. On Tuesday, air quality was in the moderate category in Spokane with smoke being the principal pollutant. A heat advisory was in effect for the western Columbia Basin and southeast Washington for highs up to 103 degrees Thursday and Friday. A red flag warning for fire danger was posted for the Cascades through 11 p.m. Thursday for heat, wind and low humidity. 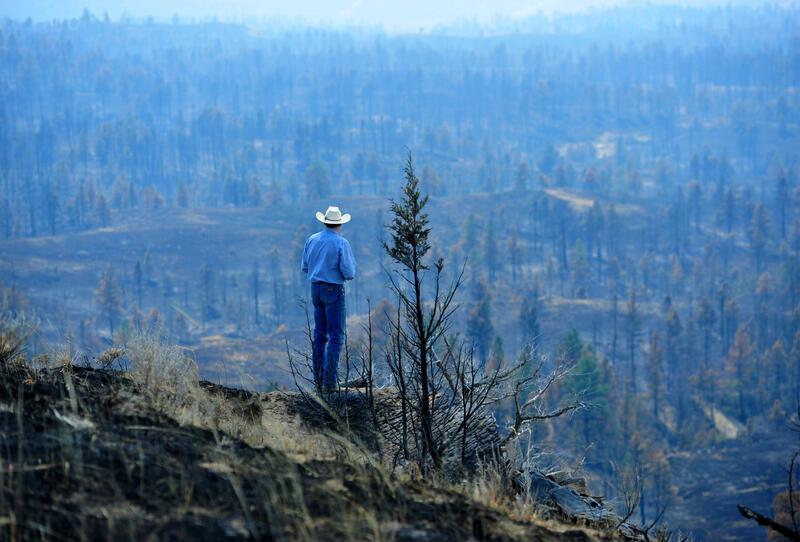 The Noisy Creek fire near Sullivan Lake in Pend Oreille County grew to 1,700 acres. Wildfires in the southern Idaho Panhandle and Western Montana blew up on Tuesday. The Sunrise Fire was burning between Alberton and Superior and mapped at nearly 10,000 acres. It was one of 10 big fires burning in Montana. The Sapphire Complex was burning in Lolo National Forest southeast of Missoula at about 12,000 acres. Weather satellite photos showed large streams of smoke coming from the wildfires. Laurie Nisbet, forecaster for the weather service, said a weak weather disturbance moving from western Canada into Montana is expected to reverse wind flow, allowing smoke to penetrate into the region. She said Shoshone and Latah counties in Idaho and Whitman, Garfield and Asotin counties in Washington are expected to get the worst smoke locally. Counties near the Canadian border as well as Spokane County are likely to see smoke from fires in British Columbia. Canadian smoke on Tuesday was threatening to affect air traffic into Seattle. Spokane is expected to see highs of 95 on Wednesday, 99 on Thursday, 102 on Friday, 100 on Saturday, 99 on Sunday and 101 on Monday. Coeur d’Alene may see a break of a few degrees with highs peaking at 96 to 97 degrees, according to weather service forecasters. As the weekend arrives, a large area of high air pressure moves northward, setting the stage for heat through early next week, Nisbet said. “Our temperatures get quite warm,” she said. The heat wave is likely to continue early next week. The record high in Spokane was 108 degrees on Aug. 4, 1961. Published: Aug. 1, 2017, 6:20 p.m. Updated: Aug. 2, 2017, 7:56 a.m.